One of the most unexpected things that happened to me in a theatre last year was me tumbling utterly for the charms of Noises Off. 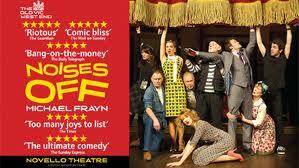 As detailed in my review from then, I’m really not a fan of farce but Michael Frayn’s play is so much more than what I’ve come to associate with the genre. Intelligently written in its deconstruction of it but still imbued with an affectionate warmth that shines through as this touring theatre company of misfits struggle across the country with a stuttering show which increasingly disintegrates as their shenanigans threaten to derail the whole shebang. The show has transferred from its sell-out run at the Old Vic to the Novello Theatre where it will play til the end of June, and rather impressively it has managed to hang on to a large proportion of its cast. So one can still experience the glorious turns from Celia Imrie, Janie Dee, Karl Johnson et al and if anything, their performances have become richer in their perfectly timed interactions and comic desperation. The two new arrivals – Alice Bailey Johnson and Lucy Briggs-Owen – have slotted in extremely well. Bailey Johnson’s wailing ASM is good in a rather limited role but Brigg-Owen is excellent as the blank-eyed Brooke whose limitations are exposed as often as her contact lenses fall out. Second time round, I have to say I enjoyed the play just as much. The first act was still a little slow going as it cleaves quite closely to traditional farce, but the second half more than makes up for it firstly with its masterful backstage-led expose of what goes on behind the scenes whilst a play is running and then lastly with the almost-complete collapse of the production as it staggers into its last leg on its last legs. I have to say I found this final act the funniest this time round: the knackered vitriol flying around, the desperate improvisations, the sheer hilarious frustration of it all. Generally speaking it takes a lot for me to revisit a production, and I never imagined I’d be keen to revisit a farce of all things, but I’m mighty glad I did. And though I may be contributing the kind of hype that Caroline Bishop struggles to deal with – I kind of see the point she’s making about forming one’s own opinion, but there’s something a bit churlish about denying critics the right to be effusive in their praise and so much of it comes down to personal taste in the end – I have no qualms in recommending a visit to this!